The Trimontium XI is a 11 mile trail/hill race beside the Tweed and over the three Eildon Hills beside Melrose in the Scottish Borders. Trimontium is the name of the Roman Camp at Melrose, at the end of Dere Street. I’m currently training for an ultra that finishes in Melrose, so this seemed like a good chance to have a first look at the end of the route. And I had to get in 20km the day after the 50k John Muir Ultra, so what better excuse than “having” to run a trail run in the Borders? Registration was at Melrose Rugby Club (home of Rugby Sevens) and the walls were covered with rugby history and memorabilia. Things were well organised, marshals were helpful (are you sure there’s not a cut off time?) and we walked out of Melrose to the start at 10am. 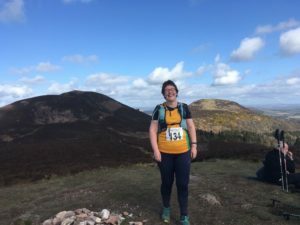 I had fun looking up at the Eildon Hills and being glad that we ran “through” them – they looked very high! I soon realised that this was a serious local event, and that my legs were a bit knackered, when I was dropped by everyone in the first kilometre. Ah well, the sun was shining, I was managing fine, the route was well-marked and I’d been told there would be a tail marshal. And so it continued – lovely trails, particularly beside the river Tweed, nice woodlands, sheep, lambs, birds singing, no sign of ANY other runners (eek!!). By this time the tail marshal had caught up with me and was busy removing signs (mostly after I’d worked out which way they pointed! ), tape, little red flags and other signs of the race. He was lovely and encouraging, and I was doing fine, my legs just weren’t going at the speed of everyone else. He was getting concerned that we couldn’t see the next people and wondered if they’d got lost, but the marshals were able to reassure him that they’d been through. 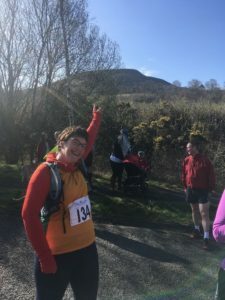 Despite the lack of sight of anyone else, I was quite happy with my 5k and 10k times – for twisty small trails and with 50k on my legs already, I was pleasantly surprised. The marshals at the aid station were also surprised that I was the last one as they’d expected to have to stand around for much longer. I was also surprised to learn that there were only 4 miles to go at that point as it seemed as if I’d just got started (brain was still in ultra mode). Then things became “interesting”. I had entered this because I like trails, I like the Borders, and I was training for a St Cuthbert’s Way run. I have a BIG map of SCW on my wall. SCW goes “over” the Eildons. It runs north-south, over the saddle between the two highest peaks. So, when I read that this route went “over” the Eildons, having followed St Cuthbert’s Way, I had taken it for granted that it followed the same route. Silly me. I was glad of the tail marshal as it turned out that we left St Cuthbert’s Way, and instead of cutting through on the lovely path to the saddle, and straight down in to Melrose, we turned west, then back east, climbing up and down EVERY SINGLE ONE OF THE EILDONS. I am glad I did not know that before starting, and indeed before arriving at the foot of the hills. The tail marshal was lovely and offered advice and encouragement and a steadying arm on a couple of scrambly occasions. I was still quite happy, just trudging stoically on up a steep scree path, or down technical descents. On tired legs it wasn’t the time for heroics! We did catch up with two men on the second hill. One said he couldn’t climb hills and the other couldn’t descend, and they had done the John Muir Way Relay (2x25km) the day before so were also on tired legs. They insisted on stopping to shake me by the hand when they heard I’d done the full JMW route! On we went, and once up the third hill I was able to get ahead and run back down towards Melrose. I was unimpressed to be pointed east away from the town at the bottom of the hill, but we soon met a path that headed back west towards the finish at Melrose Abbey. I wasn’t the final finisher, as I’d expected, I managed 3:05, and the two men we’d met came in a few minutes later with the ever-smiling and still-collecting-arrows-etc tail marshal. Back to the rugby club for sandwiches, cake and a leg massage before being driven back home. It was a great local race, a 7 mile trail race followed by a 4 mile hill race, the weather was lovely, conditions underfoot were great, and I learned to ALWAYS study the route map CAREFULLY if you don’t want a nasty surprise! Strider result – Fiona Tweedie 104/106 3:05.